Poltavska oblast is situated in the central part of Ukraine. It has an area of 28, 800 square kilometers, the oblast’ population is more than 1.5 mln people. Poltavska oblast borders upon Chernigiv, Sumy, Kharkiv, Dnipropetrovsk, Kirovohrad, Cherkasy and Kyiv regions. The oblast is divided into 25 rayons and 15 cities. The important cities within Poltavska oblast include: Komsomolsk, Kremenchuh, Lubny and Myrhorod. The oblast is a center of Ukraine’s oil and natural gas industry. There is a major oil refinery plant in Kremenchuh city. In general, there are more than 370 large industrial organizations in the oblast. Important iron ore processing facilities also present. Located on the left bank of Dnieper river, historically Poltavska oblast was the part of the Ukrainian Cossack State. 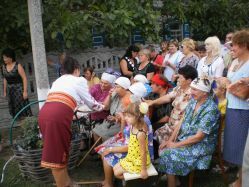 Implementation of the first phase of the EU/UNDP CBA Project commenced in Poltavska region during December 2007. Second phase of CBA Project was launched in July 2011. During this time 68,705 men, women and children of the region have benefitted from improvement in 28 schools/kindergartens, 6 healthposts, 30 water supply, 24 street-lightning microprojects (7 of them – using alternative sources of energy) and so on. This happened through joint effort of the citizens, oblast/rayon/local level governments, the EU/UNDP CBA Project and the private sponsors. Third phase of the EU/UNDP CBA Project was initiated in Poltavska oblast with regional launching and signing of MoU which took place on 9th October, 2014. The oblast received a quota of 8 rayons for standard\replication components. Rayons selected for the EU/UNDP CBA-III Project: Zinkyvskiy, Kozelshynskiy, Kremenchutskiy, Lohvytskiy, Orzhytskiy, Pyryatynskiy, Chutivskiy, Shyshatskiy. Micro project approved as of 4 January 2016: 27 micro projects (1 – health, 18 – energy saving, 2 – water supply, 6 – energy efficiency). Around 16,400 persons will benefit from implementation of these initiatives. Total budget for the initiatives is approx. UAH 9.6 mln (USD 432,432). The EU/UNDP CBA Project will provide around UAH 5.8 mln (USD 261,261). 2 cities supported for partnership in the EU/UNDP CBA Project within the framework of the urban development component – Myrhorod and Komsomolsk. Microprojects approved as of 12 January 2016: 13 micro-projects (7 in Myrhorod and 6 in Komsomolsk). Around 7,500 persons will benefit from implementation of these initiatives. Total budget for the initiatives is around UAH 4.7 mln (approximately USD 212 ths). The EU/UNDP CBA Projectwill provide approx. UAH 2.6 mln (more than USD 117 ths). The EU/UNDP CBA Project supported 2 microprojects in the oblast aimed to address this issue: in Nova Galeshyna and Komsomolsk city. In village Nova Galeshyna of Kozelshynskiy rayon in Poltavska oblast the EU/UNDP CBA Project together with local authorities fully reconstructed the living building of the village for accommodation of IDPs for a total amount of more than UAH 1.3 mln (more than USD 61 ths). The CBA part is UAH 930 ths (around USD 44 ths). In the reconstructed building the windows were replaced, a new water supply system, sewerage and heating systems and boilers were installed, special hand rails were installed, bathrooms were repaired, walls, floor and ceiling were reconstructed on the first floor. The renovated building will be officially opened by the end of July 2015. More than 70 IDPs will find their temporary shelter in the building. In Komsomolsk city the building of Slavutich hotel is also fully reconstructed for accommodation of IDPs for a total amount of more than UAH 770 ths (more than USD 36 ths). The EU/UNDP CBA Project part is more than UAH 614 ths (around USD 29 ths). In hotel Slavutich windows and doors were replaced, a new sewerage system was installed. After full reconstruction 56 IDPs will live in the building.